To restore individual files and folders from FAT, NTFS and ReFS file systems, you can use the File-Level Restore wizard. Veeam Backup & Replication mounts VM disks from the backup or replica to the mount server under the C:\VeeamFLR\<vmname> folder. For more information on the mount server, see Mount Server. For accessing VM disks content, Veeam Backup & Replication uses its proprietary driver. VM disks are not physically extracted from the backup file or VM replica. Veeam Backup & Replication emulates their presence on the backup server or Veeam Backup & Replication console. The backup file or VM replica itself remains in the read-only state. Veeam Backup & Replication launches the Veeam Backup browser where mounted VM disks are displayed. You can browse the VM guest file system in the Veeam Backup browser. If you restore files to the original location, Veeam Backup & Replication creates an additional mount point on the mount server associated with the backup repository on which the backup file resides. The mount server is typically located close to the backup repository. 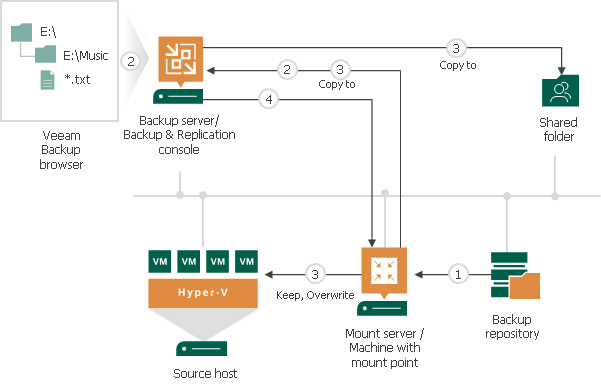 The second mount point lets Veeam Backup & Replication route for VM data in an optimal way and reduce load on the network. In the restore to original scenario — from the mount server to the original location. The first mount point here is used only for browsing the VM guest file system. In the restore to new location scenario — from the backup server or Veeam Backup & Replication console to the specified new location. When the restore process is finished or the Veeam Backup browser is closed by timeout, Veeam Backup & Replication removes mount points from the backup server or machine on which the Veeam Backup & Replication console is installed and from the mount server (if the second mount was used). Depending on the restore scenario, Veeam Backup & Replication may create mount points on different backup infrastructure components. For more information, see File-Level Restore Scenarios.